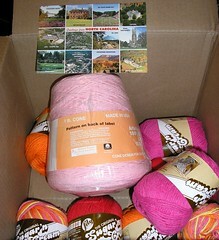 Knitting Relaxes Me: SP stash! My secret pal knew I wanted Sugar'n'Cream/Peaches'n'Cream, and she really came through! Look at that 1 pound cone of pink Peaches'n'Cream! The only colors I've seen here in the pounder size are white and ecru. And the other colors are all perfect, too -- red, bright pink, orange, and bright pink/orange varigated. It's funny that this got here tonight. Over the weekend, I had this unquenchable desire to knit a 'warshrag.' I looked at my tiny stash of Sugar'n'Cream (bought at WalMart -- all varigated and neutrals) and was very unhappy. I went by Hobby Lobby and picked up a few colors from their rather pathetic selection and started this -- the blue is actually more of a blue green and the red is kind of 'off-red' -- close to real red, but just not quite. I'm really happy with its retro look but as I was working on it, I wished I had a bright pink or orange to do the last few rows in -- and now I do!!! !